is an acrobatic, enthusiastic regular at the San Diego feeder. the faithful hummingbird in several varieties. He regretted that he was not a bird, and could not be in two places at once. Finches frequent feeders in Montana as well as, here, San Diego! WHEN WE'RE apart for a few weeks during the summer, my partner Bruce Keller and I use birds as a conduit. They help keep us connected across the Rockies, from the mountains and prairies "to the oceans white with foam." He near the sea in San Diego and I in the rural northern Rockies compare notes on birdies. Sometimes, they're the same birds, which seems a miracle to us both. Do I mean the literal "same" birds? 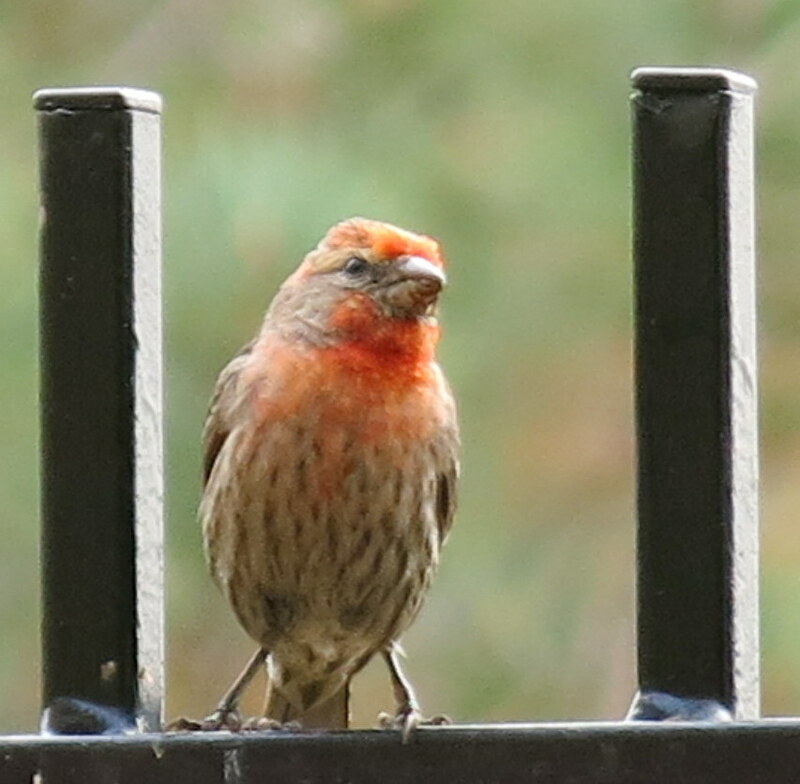 Well, no, of course not, but taking into fantasy, I might say, "I sent you a red male finch to say hello." And he might report he's sending a yacking jay or a nimble nuthatch to visit me. SO WHAT if it is not the same bird visiting me one day and Keller the next. It is reassuring that we both see the same bounty of beautiful birds in our two bird-welcoming digs. 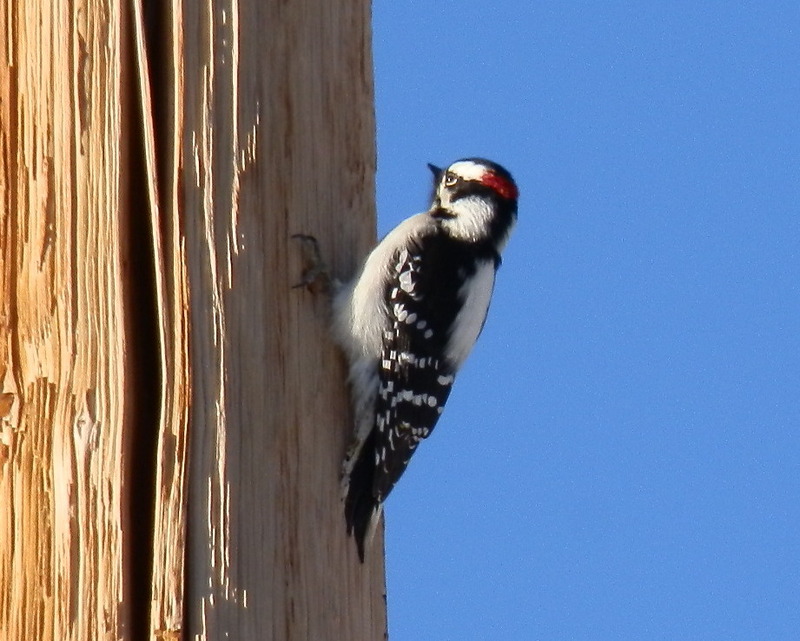 This downy woodpecker likes the telephone poles at High Chaparral. 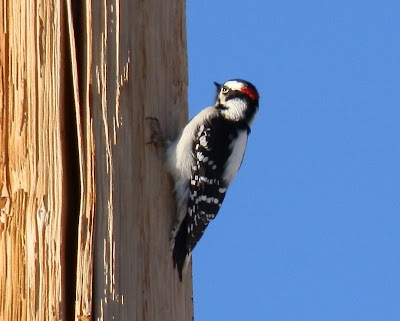 This one spends part of each afternoon pecking away in Montana. Our separate but equal feeders (easily a dozen or more) adorn a small town home patio in La Jolla and a 14-acre spread in the mountains of Stillwater County, Montana. THE SAN DIEGO feeders hang on wrought iron fencing, in the middle of the city overlooking a pretty park at the patio's edge. The Beartooth feeders balance from fence posts and aspen trees, Scotch pines and chokecherries. They're "home on the range" feeders, while the San Diego ones are for city slicker birdies. The little red house finches frequent feeders in both Montana and California. So do the little gold finches, several blue birds and jays, orioles and a host of sparrows. in both their native states, this one in California. SO WE LET the birdies connect us and they provide constant joy and entertainment whether we're in the same zip code or hundreds of miles apart. He calls me in Montana to see which feeders get which seeds. "Put a couple cups of thistle in the tube. Put the sunflower seeds in another one. Put the mixed seed in the glass and nail up an occasional orange or apple to attract the birds that like fruit. Beware, though, to keep the area clean. the juice will attract ants." THROUGH THE CENTURIES, poets have rhapsodized about birds -- perhaps as many lines as have been penned about the wonders of sun, stars and moon. From the Bible to Milton and Tennyson and Emily Dickinson, the bird is the word. "....And he shall rise up at the voice of the bird," Ecclesiastes. Christina Rossetti likened her heart to "a singing bird, whose nest is in a watered shoot" because she knew her love was coming visiting. Shakespeare's Juliet awakens with her Romeo "and yet no further than a wanton's bird/who lets it hop a little from her hand." This makes Romeo wish he were her bird, frolicking in his young lover's warm hand. Yet she fears if this were possible, she would harm him -- "kill thee with much cherishing". The rare sight of a a pair of eagles thrills, in Montana near High Chaparral. And so it is with extreme beauty. It's almost heartbreakingly beautiful. We realize it is impermanent and will not last. We fear something will harm it.
" rare bird on this earth, like nothing so much as a black swan." IN MONTANA, the "black swan" would be a pelican. In our San Diego back yard, the ''black swan" would be a bald eagle. We have yet to spot an eagle there, although we have many majestic, swooping red tail hawks. to come upon them in Montana, though! I've never seen a pelican here in the Beartooths. So Keller, could you kindly send one over -- just for the afternoon? I promise to return him unharmed. And I'll do my best to manifest an eagle for you and send him to our San Diego back yard by the park. Perhaps I'll be lucky and produce a pair! Anything is possible in love and nature. 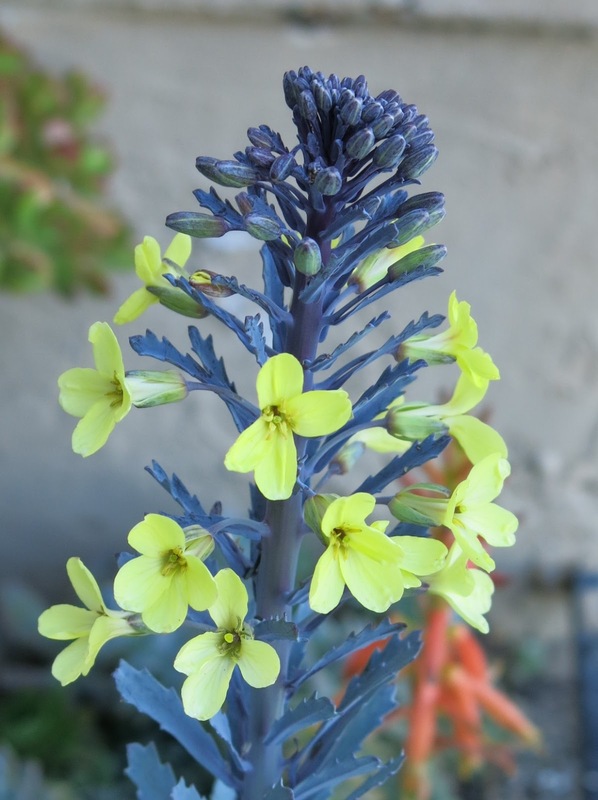 COMING: Flower power -- from the Rockies to the oceans, a bower of flowers comes your way. Plus European travel tips, gliders, summer theater, travel photo pointers, getting an out-of-state driver's license, sailing San Diego's beautiful bays, and much more. We'll also share recent photos we took on a trip to Brazil, a hot spot in the news now. Remember to explore, learn and live!